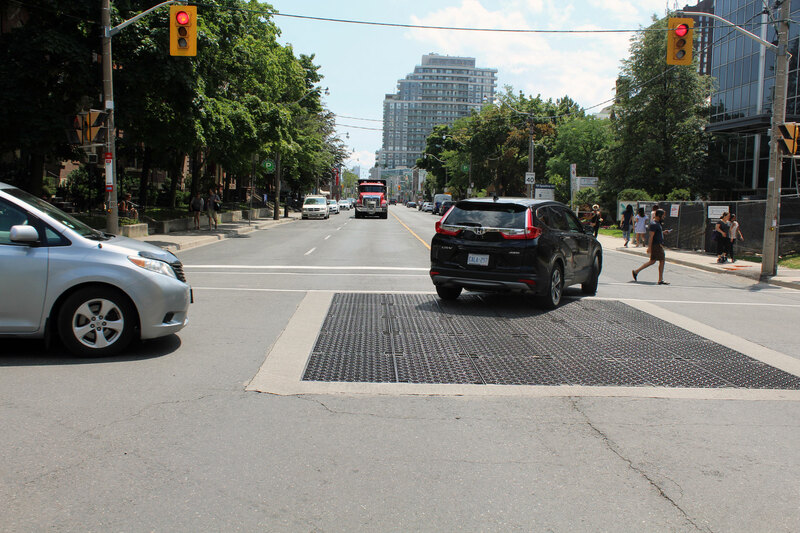 Following an active campaign led by Sandra Shaul and other members of the Annex Residents’ Association (ARA), the City of Toronto is moving to give pedestrians a little more space (and safety) on Spadina Road. “I’m not a downtown elitist who hates cars. I’m a downtown person that gets from A to B by walking or cycling. Cars are not the best way to get around so you have to respect other modes of transportation and make them safe,” said Shaul about her initiative to reduce the dangers of Spadina Road, particularly between Bloor and Dupont streets, where the road is wider than other parts of Spadina Road. The City of Toronto plans to slow traffic down in the area by narrowing Spadina Road between Bloor and Dupont streets and make wider sidewalks while retaining the road’s four-lane format. The road is currently 15.2 metres wide, and each lane is 3.8 metres. The narrowed passing lanes will be 3 metres, and the curb lanes will be 3.3 metres. The new lanes will be painted in August, with tree planting and widening of the sidewalks done at a later date, still not set. Shaul has lived in three houses in the Annex over the course of 32 years, and calls that section of Spadina Road a racetrack, having seen various accidents in the area. She also says the sidewalks and appearance of the street are due for an upgrade. Her vision includes bringing back grassy boulevards and the tree canopy that once used to mark the street. “We want safety and we want the city to look beautiful,” she said. The city will also add two new traffic lights on Spadina Road next year. One will be between Bloor and College streets, and the other near Blue Butterfly Montessori School. And a new mid-block traffic control signal was approved for Spadina Road between Bloor Street and Lowther Avenue.